The concept looked to respond to the clients requirements in a simple and sensitive manner that is subservient to the existing property. The proposed extension will sympathetically reflect the scale and proportions of the existing property while providing a precisely detailed contemporary addition. The new extension purposefully does not reflect the hipped roof of the existing property and embraces traditional gables to give a counter point which will help to visually maintain the scale of the existing property, whilst providing a dynamic vaulted internal space. The new extension will be constructed of white painted brick and bituminous corrugated cladding. 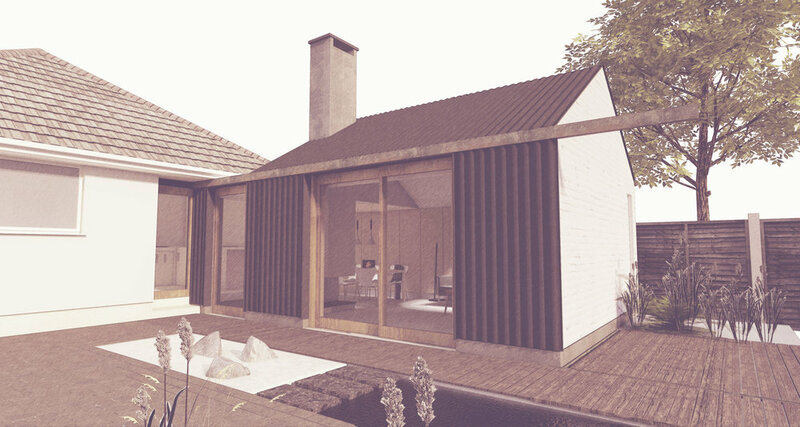 The pitched roof will also be finished with the same recycled bituminous corrugated cladding giving the feeling of wrapping.